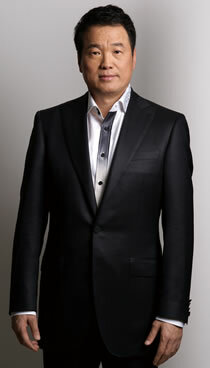 Huang Nubo is the founder and the Chairman of Beijing Zhongkun Investment Group Co., Ltd since 1995. Graduating from Peking University with major in Chinese and Literature in 1980, he entered and worked for The Central Propaganda Department until 1990. Then he entered into Chinese Mayors Association where he has been serving as Deputy General Secretary and President Assistant to present. He studied EMBA in CEIBS, China Europe International Business School, from 1996 to 1998, which plays an important role on his way to becoming a successful entrepreneur. Zhongkun Group is unique in the field of real estate and resorts, which is the only private enterprise in China that operates a world cultural heritage-Hongcun-a famous scenic ancient village in south China. Zhongkun Real Estate aims to keep its high reputation and Zhongkun Resort aims to build a respected global resort brand. As the Chairman of Zhongkun, Mr. Huang calls for “Let’s do more for our community” as the purpose of the company at the first day of its foundation. He always persists in undertaking the citizenship responsibility and implementing his promises in his action. What’s more he also commits himself and his team to conservation during every development project, including protection of the surrounding environment, local lifestyle, ancient architecture, unique wildlife, minorities etc. He acts as the Councilor of the Nature Conservancy, the Chairman of WildAid China Board, the Fellow Member of the Explorers Club, the jury member of the committee of the Paulson Prize for Cities of the Future of Paulson Institute, the Vice President of China Real Estate Chamber of Commerce and the Councilor of China-U.S. Center for Sustainable Development, to name a few. Particularly, he has devoted himself to charity, especially in the field of education, cultural exchange and environment conservation. On behalf of Zhongkun Group, as of 2012, Mr. Huang has donated over 376 million yuan . In 2006, he donated 30 million yuan to found Zhongkun Poetry Foundation, with the purpose of promoting the poetry communication internally and internationally. In 2010, he donated one million dollars to set up China Iceland Culture Fund to promote and enhance cultural cooperation with a special focus on literature, in particular poetry, between Asia and Northern Europe. And he also provided one million dollars to support the environmental projects of the Nature Conservancy in China. Mr. Huang was elected into a series of rankings, including Forbes Chinese Rich List, Forbes Chinese Charity Rich List, Hurun One Hundred Rich List, Hurun Charity List, and Forbes Asia Charity Heroes during these years. With the pen name of Luo Ying, Mr. Huang is also a poet and serves as the director of the Chinese Poetry Institute, the deputy director of the Chinese New Poetry Research Institute of Peking University, and the vice president of Chinese Poetry Research Institute of Peking University. 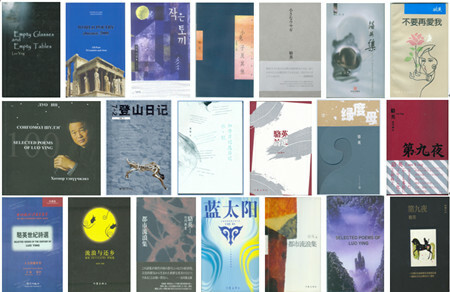 Numbers of his poetry anthologies and novels have been published and translated into English, French, German, Japanese, Mongol, Spanish, Korean, Turkish and several other languages. Besides, he is a famous mountain climber and serves as the vice president of China Mountaineers Association. During 2007 to 2011, he reached the highest summits of the seven continents of the world, and successfully arrived at the North and South poles. 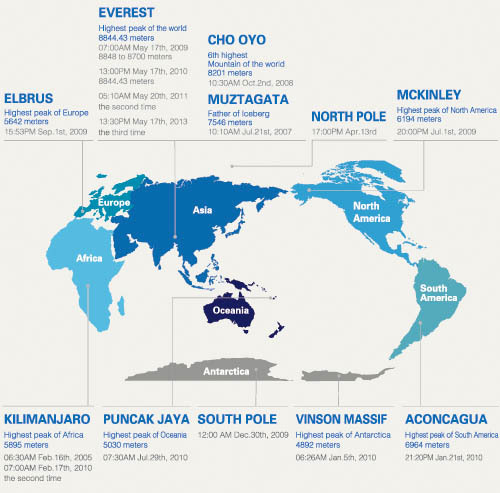 He has reached the summit of the Everest for three times, in 2010,2011 and 2013.